Tonight our son Matthew (11) attended the first session the Canadian Hockey Enterprises Goalie Camp. Each evening this week, several dozen young, aspiring goaltenders will spend 2 hours doing various drills to improve their skills. When registering Matthew for the camp we wondered if his aching body would be able to withstand the physical beating. Matthew is in constant pain when he walks. He has a very pronounced high arch in his feet caused in part by a tethered spinal chord. Watching Matthew ply his trade on the ice tonight was a bittersweet experience for Carol and me. 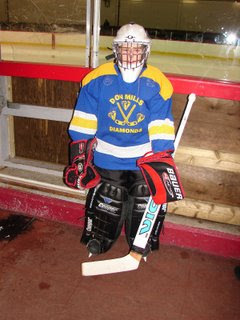 We are thrilled that Matthew, with all his challenges, is brave enough to enroll in a hockey school when he knows that he'll be up against other boys (and some girls) who aren't shackled with all the physical setbacks that Matthew has. Tonight Matthew was wondering if his body will be able take the 2-hour sessions each evening this week. We assured him that if it's too much for him, he can walk away and we won't be disappointed in him. What a fighter he is! He doesn't want to quit but he may be forced to. Thanks for praying for Matthew! What a blessing our chosen son has been to us! Okay, who's standing in the corner, now...Pilgrim Pal?! you are so right to be pppround of your chosen son's achivements. I am not much into sports myself, but I think, at least in the Olypic Games, the saying is, the most important thing is not to win, but to participate. That's what you have taught your son to do. That's what we all should do.